Did you know that talking it out enhances problem-solving, learning, and our ability to transfer learning from one task to another? Think about your classroom for a moment and ask yourself who does most of the talking? If it is you, this post will help and if it is students, this post will help. We all want to improve classroom conversations so that students improve their thinking, reasoning and problem-solving skills. There is another benefit to conversations. Students will improve their listening skills, they will learn and retain information better because they will have to think about what is being said and can come up with agreements or disagreements. 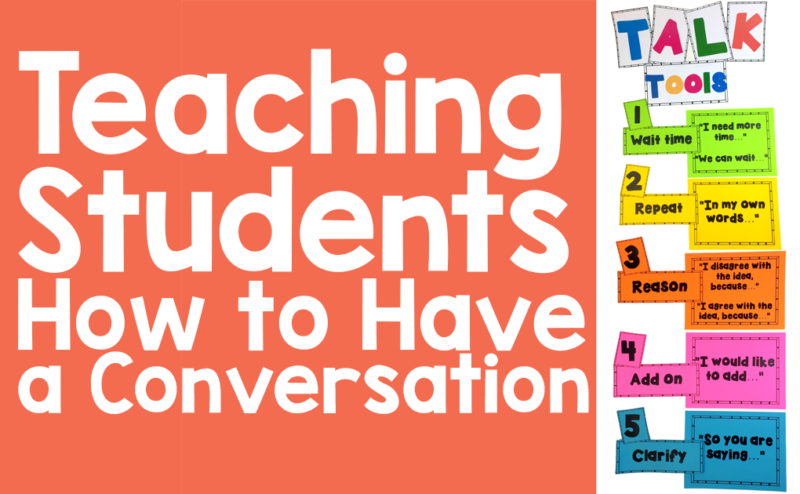 Students need effective practice and time to develop conversation skills. When we solve problems and reason topics, we do most of our thinking and talking in our heads. Students need to learn to do this, so we teach them to do it outside of themselves first. Through whole or small group students will have a chance to be engaged in reasoning. We will facilitate and guide but not focus on providing answers directly. Instead, we will work on guiding them and leading them through discovery and exploration of concepts that will help them to better understand and remember. When we teach a concept, we always teach vocabulary and meaning but are we allowing students to use it in conversation? Conversations are so important. Students will use vocabulary, concepts, reasoning, opinions and critical thinking to explain and reason behind their thinking. They will learn to agree and disagree and most importantly change their minds when provided with new information. Conversations can also reveal understanding and misunderstanding for the purpose of informal and self-assessment. It can support language development and help support social skills. We listen carefully and try our best to understand. We explain our thinking with reasons. We can ask people to repeat what they said and ask for clarification. When we disagree, we disagree with an idea not the person. We will listen and decide if we should change our mind about what we think.There are tools that can help us to better facilitate discussions, they are called Talk Tools (Chapin). So have them turn and partner talk. This is where wait time will be your best friend, don’t let any student off the hook. Use Repeat, Adding on, and reasoning for agree or disagree responses. Nonverbal signals allow for all students to engage without the class getting out of hand. Edutopia has a great poster and wonderful article explaining the importance of hand signals. When incorporating talk into the curriculum more intentionally you will have students listening to their peers and engaged! Active listening will clearly happen when students are encouraged to add on or repeat their peer’s words. It is an excellent way to check in and do a quick assessment. The students will show support and encourage each other. They will be more comfortable to speak and share their ideas. Talk tools will help their confidence grow. If you need more help in implementing talk tools, please take a look at this great paper – it is about implementing talk tools in math but I find that it is useful for any subject and topic.